PanARMENIAN.Net - Japanese Foreign Minister Tarō Kōno will visit the Armenian Genocide memorial when he arrives in Armenia for an official visit from September 2 to 4. The diplomat will pay tribute to the 1.5 million victims of the first Genocide of the 20th century, perpetrated at the hands of the Ottoman Empire between 1915 and 1923. Kōno will arrive in Yerevan at the invitation of his Armenian counterpart Zohrab Mnatsakanyan and is also set to meet President Armen Sarkissian and Prime Minister Nikol Pashinyan. 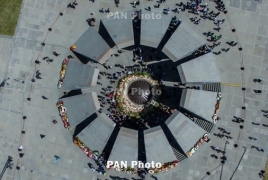 On April 24, Armenians worldwide commemorated the 103rd anniversary of the Genocide which began in the Ottoman Empire in 1915 and continued until 1923. Some three dozen countries, hundreds of local government bodies and international organizations have so far recognized the killings of 1.5 million Armenians in the Ottoman Empire as Genocide. Turkey denies to this day. Colorado Senate has unanimously voted to designate April 24 as “Colorado Day of the Remembrance of the Armenian Genocide”. Azerbaijan initiated major military operations, making use of almost all the types of equipment it possessed in its arsenal. Greece march urges Turkey to recognize Armenian Genocide The Armenian Community of Greece commemorated the 104th anniversary of the Armenian Genocide with a protest march.